Shadowmere spoke of her human doing something similar, but with flowers for their dead. That somehow felt right; not everyone could have the ability to create pleasant scents, so they had to compensate somehow. Looks like some things crossed culture lines. She imagined that they must cover the bodies in flowers before placing them in the dirt. As she looked over Shadowmere, she imagined that it must take a lot of flowers, and she wondered how they managed in winter months. Then again, warmer climates might not be as barren as her home in the middle of winter. She muttered, "That must take a lot of flowers..."
She barely heard Phobos mutter as he followed her out, ”Putting bodies in rocks...I'll never understand it.” That utterly perplexed her. Rocks? Where did he get that from? She was fairly certain he understood the difference between rocks and the ground, but... maybe he was referring to something else? The Vivillon simply offered, "I'm not sure about humans, but my swarm simply dug holes in the ground. It was better than leaving them out and attracting predators." She nodded, "Yes, please. And again, be careful." Graveyards. He looks again at the dead Bulbasaur, feeling pain clog his chest again. He remembers those. He remembers the sorrow of where the dead are laid to rest. The part that comes after the funerals. Anne's mother died long before he came to live with them, but he remembers the girl going to "visit" her mother, explaining death and funerals to him as she went about touching the headstone as if it were the woman's face. As if it would somehow connect them across planes of existence. At least she even got a funeral, though. At least she's somewhere safe and pretty and had some measure of dignity. But what would the headstone matter, if people no longer stopped by to read it? The cemetery would decay without care. There would be nobody to lay flowers or to come talk to her. Would she get lonely? Is death lonely without visiters to the resting place? How many thousands are lonelier than even she, because their bones were never buried, their remains scattered, their ends full of pain and gore and horror, with no survivors to mourn? Was his Annie among them? He'd better stop; at this rate he's going to cry. He turns wet eyes to Isolde as she murmurs to herself. "That must take a lot of flowers..." Why? ”Putting bodies in rocks...I'll never understand it.” Huh? He can't remember the last time he got lost in a conversation so quickly. But confusion is better than grief, at least. "I'm not sure about humans, but my swarm simply dug holes in the ground. It was better than leaving them out and attracting predators." "Yes, please. And again, be careful." The subject of death hung heavily in the air, making it so thick that the fire hound found it difficult to breath, let alone talk. She shouldn't have mentioned the graveyards. Now they were just on a sore subject, one which sent chills of sadness up Shadowmere's spine. "That must take a lot of flowers..." Her bright blue eyes looked up at the white-winged Vivillon, tilting her head to the side. "N-not really. We w-would just gather a couple of flowers and place a few on each grave, not too many, but just enough to let whoever might have been watching that we cared." She muttered quietly, unsure if Isolde had even heard her. She barely heard herself speak. ”Putting bodies in rocks...I'll never understand it.” Looking up at the small ghost, Shadowmere tilted her head to the side, confusion etched into her face. Rocks..? "They're not put into rocks. The rocks are just to show where they are buried." Shaking her head to try and clear her thoughts, Shadowmere trotted to the door, where it looked like everyone was beginning to leave the room. Probably for the better. "Yes, please. And again, be careful." She went to speak, but a wave of doubt washed over her. What if it was nothing? They would probably think that she's a useless scent hound then. What kind of dog can't sense danger? That would be me. I didn't smell the Bulbasaur. Why would there be anything dangerous in here? She shook her head, stepping back. It's probably just my imagination. The explanations he gets from the other Pokemon still don't really make sense in his own head; there must be a bigger gap of understanding between creatures like himself, and those of the corporeal kind than he originally thought. After all, there's a good chance ghosts don't have to worry about leaving a body behind upon their second death. Phobos doesn't know for sure, but he's heard stories...not that such tales ever made him feel better. He can't focus on that right now, though; he's got a job to finish. "I will," he answers, though the response is far more confident than the ghost truly feels. That Pokemon in the first room set off several warning bells, and he doesn't have a good feeling about the last room because of it. Who knew how many vengeful spirits are lingering in this house, itching to inflict curses Phobos himself could never dream of casting? The fuzzy memories of the curses cast upon himself by Deimos bring what can best be described as a shudder through the ghost's misty form, but he can't just give up now because he's frightened. People are depending on him. What if Phobos chooses not to go in first, and someone gets hurt because of it, hurt by something that wouldn't have affected him at all? There's no way Phobos can let that happen-he won't let that happen. The ghost tries phasing through to the other side of the room, same as he did before. He fails, still on the wrong side of the wall, as if the material simply won't let him in. His eyes go wide. Phobos attempts it again, and slips through with no problem at all. What was...? Dear Uxie, what is wrong with him? The ghost can see wisps of himself breaking off from the center of his being, dissipating into the air. He can't be falling apart now, now is the absolute worst time for this, he's got to keep it together. Looking around the room, Phobos sees nothing that could be threatening, but it's still not a pretty scene. The ghost might be made only of poison mist, but that doesn't mean he doesn't recognize blood. There's a reason for the term flesh-and-blood, after all. Throughout his exile, Phobos has seen blood everywhere, on walls and the ground and on other creatures, especially the red-eyes. For him, blood meant death, death and pain. Floating over to the poor creature lying on some sort of bulky object, Phobos wonders if the spirits lingering here are not vengeful in nature, but simply sorrowful. Everything in this world is dead or dying, and the spirit world can't do anything but watch. Would, one day, he end up among them? At least he didn't have any real family left, or friends; it'd be easier to watch a world fall apart when nobody you cared about existed in it. Though...it would be sad to not be able to talk to the three in this house any more. No, he can't think about that. Phobos has to focus on his task. This creature has likely been dead for a long time, but that's not what grabs the ghost's attention. It is-or was-a human. Throughout his entire life, Phobos never had the opportunity to get close to a human, and his mother described them as fickle, short-tempered beings, terrified of ghosts. With the arrival of the red-eyes, he probably would never get the chance to see a living human. But this one? Phobos didn't have the slightest clue as to what had caused it to have such a weird, gaping hole in its head. What could possibly inflict an injury like that? Phobos quickly scanned the room, but found nothing extraordinary or capable of creating any sort of gruesome wound. This isn't something I can just file off as nothing! If there was a creature, or object, or anything that could kill a human in such a brutal fashion, then the entire group had to know. Phobos is about to leave, but with one glance back at the dead human, something new catches his eye. They were...holding something? He drifts closer to the hand, wondering what the heck it is. To the ghost's frustration, he can't recognize the unfamiliar, blocky shape, nor why a human would have been holding it as they died. Was it some sort of weapon, maybe? Unable to move the dead human's hand to get a better look, Phobos gives up trying to figure out what it is by himself; surely the others would have a better chance of solving this mystery. Not having necessary knowledge really sucked. Returning to the other side, Phobos is thankful that, at the very least, his abilities weren't acting up again. "There's nothing in there but a dead human," the ghost reports, "I don't know what killed it, though. It had, like...a hole in its head? And there was blood on the wall behind it. I've never seen something like that before." Embarrassment is flooding his mind; could he possibly look any more stupid than right now? Phobos took pride in his knowledge, but right now he doesn't know anything. "I tried looking around for what could have done it, but all I found was something in the human's hand. It was weird and blocky, and-and metal? I think?" Metal is not something really that familiar with Phobos either, other than the fact it is supposed to be shiny and humans really liked the stuff, or something like that. "I, uh, couldn't really see it that well..."
The ghost spoke with more confidence than Isolde felt, "I will," before phasing through the door again. Or.. at least he attempted to. After a moment of second of shock, he tried again, and he went through just fine. Isolde was mildly concerned for the small ghost, but she wasn't sure what would cause a ghost to be unable to go through objects. Once again, they were left with a few minutes of waiting, and Isolde nervously grabbed at the eye covering that hung around her neck. Pixel eyes darted back to the other half of the house as they waited, and she fluttered closer to the exit of the hallway to fully settle her mind. There wasn't anything she could see, living, unead, or dead that would cause for concern. Soon, Phobos was back, and he reported, "There's nothing in there but a dead human/I don't know what killed it, though. It had, like...a hole in its head? And there was blood on the wall behind it. I've never seen something like that before." A dead human? With a hole in it's head? She was about to ask if he knew what could have caused it, but he was already answering the question, "I tried looking around for what could have done it, but all I found was something in the human's hand. It was weird and blocky, and-and metal? I think? I, uh, couldn't really see it that well..." He almost sounded embarrassed of his lack of knowledge, but Isolde had no ideas either. Humans and their contraptions were still mostly new to her. Isolde confusedly admitted, "I don't know what could have done that... If there was nothing else in there... And just a hole in the human's head..." She shook her head when her limited knowledge of humans failed her and asked the others, "Any ideas on what that metal thing could be?" She weaved her way to the doorknob and hesitated; the Vivillon didn't know what had killed the human within. What if it was something that could hurt them too? While humans, from what she had gathered so far, appeared more delicate than Pokemon, it shouldn't be that easy to put a hole in their heads. The clunky metal thing was the best guess... but it had been in the dead human's hand. Not on the floor or somewhere else... Why would someone put a potential weapon in a dead person's hand? Unless... Unless this was like when she left the swarm... in the middle of a blizzard... Visibly, her wings stopped their constant movement, and she stood on the floor. Maybe this human had used a more direct method than she did... Something deep and dark in her mind whispered, "If your strangeness hurts this small group anymore, maybe that could ensure you never do it again." Thankfully, a voice snapped her attention back to the here and now, and she shoved the thought away as she listened. No time for dealing with maybes when the present demanded her attention. The young ghost isn't gone very long, and Oliver releases a breath he didn't realize he was holding when Phobos returns. Unfortunately, he is not prepared for the news Phobos has to report. "There's nothing in there but a dead human. I don't know what killed it, though. It had, like...a hole in its head?" He freezes. A hole in the head? "And there was blood on the wall behind it. I've never seen something like that before." His stomach is sinking, sinking, sinking. "I tried looking around for what could have done it, but all I found was something in the human's hand. It was weird and blocky, and-and metal? I think? I, uh, couldn't really see it that well..."
Blocky and metal. Yes. He's right. Why is it whenever he's right, he still loses? "I don't know what could have done that... If there was nothing else in there... And just a hole in the human's head..." Oliver stares straight ahead, stricken, nausea welling up. "Any ideas on what that metal thing could be?" "A gun," Oliver whispers, feeling like he's falling. "One of humankind's most deadly inventions. It's a tool called a weapon that fires tiny bits of metal off at whatever the gun is pointed at with enough strength and speed to punch a hole through the body and go out the other end. It can punch holes in walls, too. C-can kill in an instant. It's not- it's not dangerous if the person holding it is d-dead but... but they..."
He rubs at his eyes. "If there's a hole in their head that means that they turned on themselves. So they could die fast. And it doesn't look like the dead cornered th-them or this place would be a lot m-more torn up s-so they... probably... just l-lost hope..."
Oh, wait, that's right. He swallows, but some tears leak out anyway. He scrubs at his eyes. "We... we need to... to go get it and... and bury it or s-something. The metal bits it f-fires are called bullets and if there are still any in it, and a bad human comes here, finds it, and grabs it- we'd all die. They c-could use it to kill us. S-so we need to get rid of i-it." "There's nothing in there but a dead human. I don't know what killed it, though. It had, like...a hole in its head?" Shadowmere freezes, her blood turning to ice. A dead human..? After a few seconds of opening and closing her mouth like a fish, the fire hound settled on the fact that she wouldn't be able to get a sentence out, and so she shut her mouth and just listened. "And there was blood on the wall behind it. I've never seen something like that before." A large wound in it's head, blood on the wall... All this scene needed was a... "I tried looking around for what could have done it, but all I found was something in the human's hand. It was weird and blocky, and-and metal? I think? I, uh, couldn't really see it that well..." Her fears were pretty much confirmed with Phobos's words, her muscles freezing up as her hind legs lost any form of strength, forcing the Houndoom to her haunches as she sat, blue eyes falling to the floor. So her hunch had been right. Some guard dog she was. Can't even warn her group of danger. She was worthless here, every time she smelt something dangerous, she was too damn scared to voice her opinions. What had happened to the happy, aloof Houndoom that traveled with the strange trainer who loved everything spooky, or different? Why was she no longer that strong, independent hound? Because she no longer had anyone. Krypt was gone, her brother was gone... She was truly alone, wasn't she? Sure, she had a group, she had Oliver, and Isolde, even Phobos... But none of them would be able to fill the hole left by her family's loss. The hound's blue eyes fell to the silver tag on her necklace, the crude 'S' carved into the metal, which rested snugly between the bone on her nape and her shoulders. The last memento she had of her trainer, only a small tag that held the first letter of her name. "Any ideas on what that metal thing could be?" Looking up, Shadowmere realized that she had completely tuned out of the conversation. How much had she missed? Did she miss anything crucial? What was Isolde referencing? The metal thing was... Shadowmere's eyes drifted into the room, and almost immediately, the hound gagged, backpedaling fast enough that her hindquarters hit the wall in front of the door, causing the hound to sit and back up enough to where he back was almost entirely against the wall as she raised her two front paws up to her face, rubbing at her nose in a futile way to rid herself of the stench of death. "A gun." Peeking up from in between her paws, Shadowmere looked towards Oliver as the fire monkey explained to Isolde what the metal object within the human's hand was. "One of humankind's most deadly inventions. It's a tool called a weapon that fires tiny bits of metal off at whatever the gun is pointed at with enough strength and speed to punch a hole through the body and go out the other end. It can punch holes in walls, too. C-can kill in an instant. It's not- it's not dangerous if the person holding it is d-dead but... but they..." Pushing herself back onto her four paws, Shadowmere tentatively entered the room, her head lowered and tail curled up underneath her stomach as the fire hound tried her hardest to ignore the scent of death. The iron smell of blood, the screams of pain. Cruel laughter. She couldn't do it. She just could not do it. The Houndoom turned and walked right back out of the room after getting only a few steps in, skittering over to the wall and curling against it, shaking as she lay down there, curled against herself as her paws moved to cover her muzzle, eyes glazed over as visions of that painful day came flooding back. The screaming. The goddamn screaming. Blood was everywhere. The iron smell was all that would register. That same cruel laughter rang in her mind, echoing against her head, and rebounding in her skull. Something was whining. That laugh. The cruel laughter and the sickening tearing sound of her brother's spine being completely torn from his back. The thud of his body hitting the ground. And the screaming. She couldn't even disconcern if the screaming was hers, or her brothers. The whining was getting louder. Was that her? "I don't know what could have done that... If there was nothing else in there... And just a hole in the human's head..." Well, at least Phobos isn't the only one who has been left in the dark; still, it would have been better if they never had to deal with this mystery at all. He nervously looks over at Shadowmere as the hound casts her own eyes towards the floor, wondering if his words were too blunt. He hadn't meant to hurt anyone with his explanation..."Any ideas on what that metal thing could be?" "A gun," Oliver's voice is only a whisper, but Phobos catches the words anyways. Never in his life has the ghost ever heard of a thing called a gun, but if a dead human is holding one, it can't be a good thing. "One of humankind's most deadly inventions. It's a tool called a weapon that fires tiny bits of metal off at whatever the gun is pointed at with enough strength and speed to punch a hole through the body and go out the other end. It can punch holes in walls, too. C-can kill in an instant. It's not- it's not dangerous if the person holding it is d-dead but... but they..." Phobos can only gape at the explanation; humans were capable of creating something that could kill using tiny metal pieces? The stories told to him never said much about the strength of a human, especially in comparison to Pokemon, so maybe these "guns" were made for self-protection. Still, the little ghost cannot help but think of Deimos, how much they would have relished the ability to kill so easily...are some humans like that, using a "gun" for cruelty, to hurt others for no other reason than to see them suffer? Wait. Enough strength and speed to punch a hole through a body? But, that would mean...had that human killed themselves...? Holding the gun, and a hole in their head, it only makes sense. A horrible amount of sense. "If there's a hole in their head that means that they turned on themselves. So they could die fast. And it doesn't look like the dead cornered th-them or this place would be a lot m-more torn up s-so they... probably... just l-lost hope..." Phobos looks away, unable to face the others after the thought that crosses his mind. Most things physical simply pass through him, unless they have an added power behind them, and it's most likely the gun would do the same thing. Not guaranteed, but likely. If he had the ability to, would he once have chosen to act the same way the human did...and just end his suffering? The ghost knows what it's like to lose all hope. To wish that the pain would sever him from his body for good, to spend days and weeks and months and years waiting for when the abyss would hurry up and just consume him. Is that what the human felt as well, thrown into despair by their own suffering, unable to see an end...? "We... we need to... to go get it and... and bury it or s-something. The metal bits it f-fires are called bullets and if there are still any in it, and a bad human comes here, finds it, and grabs it- we'd all die. They c-could use it to kill us. S-so we need to get rid of i-it." Phobos flinches at the thought of any of them being killed in such a fashion. It doesn't matter that he barely knows them, or that he can't properly imagine exactly what it is like to be hit by a bullet. These Pokemon offered him a place in their own shelter even after he'd unintentionally scared them, they didn't kick him out when morning arrived, they'd been nice and answered his questions...no, he won't let anybody get a hold of the gun. Phobos goes to say he has no way of getting the metal thing himself, but his voice dies as he catches sight of Shadowmere, huddling up against the wall. She both looked and sounded really spooked-no, that was more than spooked, that was petrified. Of course moods would be running low with what is going on, but this is something else entirely, radically different from how both Isolde and Oliver reacted. Even worse, Phobos is clueless as to exactly what caused this. A million questions run through his mind at once, but none of them gain enough ground to be outright asked. What is the sight of the human? The gun? Or some sense that corporeal beings have that he doesn't? "Shadowmere?" Phobos isn't sure if he should go near her, or even what he should say. Did Oliver or Isolde know what was going on? He barely knows anything about the hound, let alone what would cause such a horrified reaction, and it makes Phobos feel about as useful as the Fighting-types that tried attacking his sibling once. "Are-are you okay?" Uxie above, what is he doing asking that? Of course she's not okay! But...but he doesn't know what else to do. Oliver had a ready answer, but Isolde almost missed it in his quietness, "A gun." The word meant nothing to Isolde, and thankfully Oliver continued without prompt, "One of humankind's most deadly inventions. It's a tool called a weapon that fires tiny bits of metal off at whatever the gun is pointed at with enough strength and speed to punch a hole through the body and go out the other end. It can punch holes in walls, too. C-can kill in an instant. It's not- it's not dangerous if the person holding it is d-dead but... but they..." Oh....oh... That reminded Isolde of something... but it was something much bigger than what could be held in a human's hand... It obviously meant something terrible if both Shadowmere and Oliver appeared so afraid and... sad. Since Oliver said it shouldn't be dangerous, Isolde floated up and fiddled with the metal knob before opening the door by herself. The moment of triumph was considerably dampened by the subject at hand, and the hollow feeling from earlier hadn't completely dissipated. She turned back to see Oliver rubbing at his eyes before he explained, "If there's a hole in their head that means that they turned on themselves. So they could die fast. And it doesn't look like the dead cornered th-them or this place would be a lot m-more torn up s-so they... probably... just l-lost hope..." She was right. They had lost the will to live, like she had, but they had chosen something far more effective. Before the earlier voice could come back, Oliver suggested, "We... we need to... to go get it and... and bury it or s-something. The metal bits it f-fires are called bullets and if there are still any in it, and a bad human comes here, finds it, and grabs it- we'd all die. They c-could use it to kill us. S-so we need to get rid of i-it." ...Right. She almost wanted to kick herself for how selfish her thoughts had gone; why was she thinking of herself when the ones that mattered needed that horrid object to stay inaccessible? Shadowmere had nosed her way into the room a little, but then she promptly turned around and curled up against the wall in fear. "No... Please.. No more.." The large hound was shaking, and she started whining as it seemed like her fear overtook her. The display of emotion caused Isolde to internally panic as she had no idea what to do. Should she try comforting Shadowmere? Would trying to speak or touch the hound make this worse? Or make her lash out in panic? She needed to do something. Phobos did not seem to share the same fear Isolde did as he actually spoke up,"Shadowmere? Are-are you okay?" The small ghost's voice snapped Isolde out of her fear of inaction; if she called herself their leader, she needed to not let indecision stop her every time. She placed herself between Shadowmere and the door and flared her wings as wide as they'd go to make sure the hound couldn't see into the room. Her wings glowed green once again as she used the same attack she had earlier over the dead Pokemon's body. She wasn't sure what was causing the hound's panic, but she remembered how poorly she reacted to the males of her swarm after getting attacked. "Shadowmere," she tried to keep her voice steady, "Can you hear me? If you can, why don't you go back to the living room?" The hound needed to get away from that room, but she was far too panicked for Isolde to even think about trying to drag her. "We can handle the rest." The whole thing leaves him hollow and aching as he steps into the room and stares around it, large eyes trying to take in and process every detail. But of course, like usual, it's not enough for just him to hurt. No. As it turns out, someone is hurt a lot more by this than he is. He'd failed to notice the hound's growing distress as his own rose and sent tears building up in his windpipe, but the sound of her beginning to lose it yanked him from the haze of grief back into reality. Her nails make soft ripping sounds at the carpet as she doubles back out, Oliver watching, fear choking out the grief. Is she having an episode? Does she know where she is and who is here? "Shadowmere? Are-are you okay?" The ghost's voice coaxes a croak from Oliver's throat as he tries to speak, to say something, and fails. Where has his voice gone!? Thankfully, Isolde has far stronger a mind than he does. She approaches the Houndoom and flares her wings, hiding what lies inside the room from Shadowmere and cutting frozen Oliver off from seeing the dog. "Shadowmere. Can you hear me? If you can, why don't you go back to the living room? We can handle the rest." "Sh-she-" SPEAK. "She m-might- might not- might not kn-know what's- what's going o-on? M-might be conf-fusing the p-present with the p-past." He tries to explain that, tries to make it sound less insane, but his words die in his throat and breathing is getting hard. Panic is contagious. He doesn't realize he's started shaking uncontrollably. The stench of death hung over the fire hound like a smothering coating of fog. She couldn't breathe, her eyes were wide as fresh tears ran down the stained tracks that ran down her face. She couldn't speak, the only sounds that escaped the hound were pitiful yelps and a long, continuous whine. Each breath inwards was a short yelp, and each breath outwards emitted a pitched whine that was only a few decibels from ear-peircing. "Shadowmere?" The small ghost's voice was warped in her clouded mind, the word coming out as a sneering jab at her. The blurred visage of the cruel, laughing houndoom in front of her spat out the word as a snarl. How did they know that name?? That name was special to her. They shouldn't know it. "Are-are you okay?" More taunting. The words tore at her chest, her muscles spasming as she flinched back away from the source of the voice, her paws and legs tucking further in, the large hound curling in on herself. A pleasant smell assaulted the Houndoom's plagued nose, reminding her faintly of the flowers her and Krypt used to cut. Wildflowers always had the strongest scents, and there were plenty that they would pick every time they visited. The vision warped to the sound of panicked yelling. Krypt was telling her to run. It wasn't safe. Shadowmere cried out for her friend, her only remaining family, her trainer. He wasn't listening. She would protect him. She had to. She had failed too many people already. "D-don't l-l-leave me... I-I d-don't want t-t-to be al-lone again..." I can't be alone again. Her whining had turned into quiet sobs as more tears began to drop from the fire hound's muzzle, her shaking began to worsen, her necklace tapping against the bone on her neck with a light clatter. "Shadowmere," No, no, no, no. They were back. They only knew her as Ebonesce. Who told them, how did they know? Any other words were drowned out by the endless questions. Were... Were all those people just a dream? Had she never left the grove? She didn't want to wake up, if it were a dream. Just, leave her dreaming forever. The voice was so young, her heart clenching painfully as the visage of her brother, white, sightless eyes scaring vacantly at her. Blood ran down the pup's back, bone showing through the skin as the Houndour's spine dragged along the ground. An overwhelming sense of guilt hit her all at once, her whining turning into choked sobs. "I-I'm s-sorry... I'm s-s-so sorry brot-ther... I c-couldn't s-save yo-ou..."
She just wanted this nightmare to end, so that she could go back to the dream where everything was happy. "D-don't l-l-leave me... I-I d-don't want t-t-to be al-lone again..." Phobos is at a loss for words; with the source of the hound's distress unknown to him, he can't tell what anyone should say to begin helping her. What kind of comfort could he possibly provide? More importantly, who had Shadowmere lost to bring out such a horrible reaction? While Phobos sometimes missed his parents, he couldn't comprehend breaking down this much in response to the grief, and he had nobody else to miss. This sort of anguish is one the ghost cannot understand. I don't think she's talking to me, though... Whatever Isolde had done, it doesn't seem to be helping poor Shadowmere even a little bit. What else can they do? "Shadowmere.Can you hear me? If you can, why don't you go back to the living room? We can handle the rest." There's no response from her; it's as if Shadowmere cannot hear what any of them are saying. Maybe she really can't. Phobos struggles to think of something, anything to help her...wait. Hadn't everyone mentioned earlier that sleep felt good for flesh-and-blood creatures? Would involuntary sleep still give that same feeling for them? He...he'd seen something that would make Pokemon unconscious, Deimos used that weird technique of his before...Hypnosis, I think? Only now did it click in his mind that what the Haunter had been doing was putting things to sleep; if Phobos can replicate it, then maybe Shadowmere could have some peace from whatever is attacking her mind. He hadn't mentioned it earlier for fear of inciting some sort of conflict, along with not really getting what sleep entailed, but now really isn't the time to be so afraid. It's decided. Phobos has got to do something right now. He's got to tell Isolde his idea. "I-I don't know if it would work, but-but maybe she wouldn't be so afraid if she was asleep? There's a trick my-I've seen someone use, Hypnosis, I think I could replicate it. But I don't know if it would help, you told me sleep is good for non-ghosts so I assumed..." Phobos trails off, wondering if maybe bringing this up wasn't such a good plan after all. Shadowmere wimpered, "D-don't l-l-leave me... I-I d-don't want t-t-to be al-lone again..." Whatever was going on with her, she didn't seem to understand what was real. The three of them were obviously still there, but she seemed convinced that they weren't. Isolde didn't know what to do to help the hound if words wouldn't work, and she didn't think touching her would end well. She was running out of options about what to do. Oliver was behind her, and he tried to explain what was going on with Shadowmere,"Sh-she-she m-might- might not- might not kn-know what's- what's going o-on? M-might be conf-fusing the p-present with the p-past." Speaking was becoming hard for him, and she glanced over her shoulder to see the child shaking. Oh no ohno ohno Both of them panicking was starting to get her, and her wings stopped glowing green. Shadowmere had something more to say, "I-I'm s-sorry... I'm s-s-so sorry brot-ther... I c-couldn't s-save yo-ou..." Brother? What happened to her brother? But that would be a question for later when she wasn't lost in her own head. Her wings started flaking as she prepared a use of Sleep Powder, and she reached to pull up her eye shield. Thankfully Phobos still had a hold of his emotions and asked, "I-I don't know if it would work, but-but maybe she wouldn't be so afraid if she was asleep? There's a trick my-I've seen someone use, Hypnosis, I think I could replicate it. But I don't know if it would help, you told me sleep is good for non-ghosts so I assumed..." That stopped her from immediately filling the room with powder as she considered it. Oliver didn't seem entirely lost like Shadowmere... maybe they just needed to put her to sleep while she calmed down. Isolde answered quickly, "Try it. Quickly, please." If the ghost's attempt didn't work, then she was going to go with plan B and fill the room with powder while she dealt with the body. "I-I don't know if it would work, but-but maybe she wouldn't be so afraid if she was asleep? There's a trick my-I've seen someone use, Hypnosis, I think I could replicate it. But I don't know if it would help, you told me sleep is good for non-ghosts so I assumed..." That- that's a good idea that's a really good idea please do it please. "Try it. Quickly, please." He nods his agreement alongside her, feeling his chest constrict further. I wish I could help I wish I knew what to do. If only he did; if only he wasn't so useless. If only, if only. I wonder what happened to my own broth- no not now; don't think about that now. Don't. He doesn't need to cry. Arceus knows he's weak enough without that. He needs to calm down. He needs to be there to help Isolde dispose of... of the... of the body. Let her out of this nightmare. She wanted to get out. Shadowmere's breathing was starting to become too ragged for her her to breath, each breath only coming out as a puff of smoke and a wheeze. Her thoughts were running wild, her eyes only registering a growing puddle of blood at her paws. There was screaming ringing in her skull. The mix of high pitched screams of a pained child and the devastated cries of Shadowmere mixed to create a haunting wail that echoed through her head, bouncing back and forth, escalating in volume with each second. Pain bloomed from the side of her head. When had her paws gotten up there? Her claws had dug into her head so much that a thin river of blood started to run down the side of her head. The wet feeling and the iron smell only furthered her panic, as the Houndoom began to pant desperately for any sort of air to enter her lungs. There was an odd glow off to her right, and her unfocused vision suddenly became sharp as the image of a small ghost came into view. Staring at the ghost was beginning to make her drowsy, and as much as Shadowmere wanted to fight it, her eyes began to close, and within a few seconds, the Houndoom had gone limp as sleep overtook her. "Try it. Quickly, please." If Phobos had the physical capability to tremble, he would've started doing so then and there. There are so many ways this could go wrong, the simplest of them being that his attempt wouldn't work. What if, somehow, he hurt Shadowmere instead of helping her? What if they couldn't wake her back up? The blame would rightfully fall onto him, for recklessly attempting to use a technique he has seen in action only once before...theory is one thing, but practice is something else entirely. Gods, Phobos doesn't know if he can actually pull this off. Once more, he looks at Shadowmere, words failing him as he quickly notices how she has torn through her own skin, blood streaming down the side of her head. So now the pain isn't only mental, but physical as well...There's no time for this. I gotta at least try. C'mon. I can do this. I can do this. Phobos steadies his chaotic thoughts; there's no way he can pull this off if a thousand threads are tugging him in different directions. Focus. He's got to focus. The ghost narrows his vision down to Shadowmere and Shadowmere alone, the rest of the house merely unimportant fuzz. If the other two have said anything, it's just background noise. Phobos' powers may be weak, but he can still feel an echo of psychic energy within him; all he has to do is reach for it. Please work, please work, please work. Hypnosis is all about calming the other Pokemon down through repetition, or so his limited knowledge tells him; if he can connect this calming influence to Shadowmere, would it be enough to actually put her to sleep? He can't doubt himself now. Phobos almost loses his focus completely when he sees a faint glow start to form around him. Is-is it actually working? The light emanating from him has to be the effect of Hypnosis, because he can clearly see Shadowmere's eyes beginning to droop; last night taught the ghost that this is a certain sign of drowsiness. Sure enough, the Houndoom fell into her slumber-or, at least, Phobos hoped it was sleep. Please let it be sleep. He wouldn't be able to live with the knowledge that he had caused harm to another, even if it was only for the sake of good intentions. The ghost lets the light power go, feeling the thread of psychic energy fade away; he doesn't need it any longer. Somehow, Phobos actually pulled off Hypnosis, just...just like Deimos had. He couldn't accept any feeling of pride without knowing if he'd actually helped, or merely made things worse. "D-Did it actually work? Is she okay?" Shadowmere whimpered, "St-t-top s-scream-m-ming.." Isolde felt so useless. There was nothing she could do to help the suffering hound, and knowing her shortcomings didn't help her guilt. She just hoped that Phobos's attempt worked, and before the rest of them panicked. Her pixel eyes opened wide as she saw blood dripping down the hound's head as she clawed at her own head. It was almost as if Shadowmere didn't realize just how badly she was hurting herself. Phobos quickly moved in front of the hound's head, and when he started faintly glowing, Isolde saw Shadowmere's eyes slowly close. Soon her panicked breathing slowed down to further indicate sleep, and the clawing stopped. While she felt bad for not knowing what else to do, at least now they could try to remove the problem before she woke up. Phobos was nervous as he looked over his handiwork, "D-Did it actually work? Is she okay?" Isolde nodded as she pulled herself together, "Yes. She's asleep." All business again, she quickly flew back into the room as she explained, "I don't know how long your attack lasts, so we need to hurry." They needed to do something with this body before Shadowmere woke back up and potentially had another episode. The smell of the dead human didn't bother her much as she tried to figure out what to do, but she didn't know what had caused Shadowmere's panic. Just in case it was the smell, she started using Aromatherapy again as she floated in the room. She eyed the heavy fabric that the body was lying on, and she figured that it was likely ruined for their use anyway. Washing blood out of fabric was something beyond her capabilities and knowledge. Decision made, she grabbed what she assumed were the feet and flapped her glowing wings as hard as she could. The bony protrusions gave her an easy handle, and she slowly pulled the sitting figure towards the center of the human bed. She noted that the human had strangely long fur only on the top of the head, from what she could see anyway. Breathing heavily, she released her hold, and wiped her hands on a clean part of the fabric. At this point, she looked to Oliver to ask for help covering the body and realized he was holding something. It was heavy... metallic... Oh. In her hurry she had forgotten the device that had caused this situation. "Is that... the g-gun?" she tripped over the still unfamiliar word. For some reason, she had imagined something that looked more dangerous than the small thing that the monkey was holding. She landed next to him as she tried to get a closer look. Phobos moves to block Shadowmere's path and Hypnosis is a success, putting the distraught hound to sleep. If only he could have done something. But even Oliver with all his self loathing can't find a way to pin not having a sleep-inducing move on himself. And... at least now they can do something about whatever scared Shadowmere so badly. It's definitely something in this room. Maybe the death smell...? Or the blood? The body? Those seem like the most obvious ones... oh gosh he hopes he's right about it being one of them. "D-Did it actually work? Is she okay?" He nods as Isolde confirms it verbally for the youngster, watching the butterfly approach the body. She grabs the feet, Oliver trying to avert his eyes from the ghasty sight of decomposition. The stench of death tugs at his stomach, and he gags. Steeling himself, he reaches for the gun and pulls it loose, shuddering as he handles it. "Y-yeah," he manages, heading for the door. "Just- gonna get rid of this, first." There was a backyard; he saw it. Some fresh air will help, and he can dispose of this stupid thing at the same time. That's all that was visible to the hound's sight. In her slumber, the hound began to twitch, her feet jerking violently as the claws snagged on the carpet with each movement. Shadowmere's muzzle twitched, flashing only a quick glimpse of her sharp teeth. A short muffled bark escaped the hound with a huff of air, before she went silent once more as her mind began to play through various images. She stood still, her eyes wide with terror as she stared at the monsterous houndoom in front of her, in its jaws was her brother, screaming in pain as blood dripped from his frail body and onto the ground in a puddle. She begged, pleaded and cried for the houndoom to spare her brother, to take her instead. Cackling laughter filled her mind, making the hound's body shudder once more. The houndoom began to shake their head violently, the screams only intensifying as blood splattered over the trees, ground and even getting a large glob straight to her face. The smell of iron flooded her nose, making her eyes water as the red liquid dripped down her muzzle, forming a puddle on her tongue. The taste made her gag, her own brother's blood dropping from her muzzle and onto the ground as the Houndour emptied her stomach of it's minimal contents. Shadowmere's muzzle twitched again, a quiet whine emerging from her throat as phantom screams began to bounce against her skull. Tears welled up from inside the houndoom's eyes, leaking out through her closed eyelids and rolling down her muzzle. A sickening rip sounded in the clearing as the puppy within the houndoom's jaws screamed loudly for the last time, before falling in a lifeless heap on the ground, the pup's spine still firmly in the jaws of the houndoom. Sobs began to fill in the silence, tears streaming down the remaining houndour's face. With a muffled sob, Shadowmere's body began to shake lightly as more tears began to run down her dark fur, dripping onto the floor after her fur couldn't hold any more moisture. "Yes. She's asleep." Isolde's confirmation of his success is a relief for the ghost-he hadn't screwed things up after all. However, he doesn't get much time to breathe freely (metaphorically, of course) before the Bug-type is already rushing back into the room, with Phobos following. She really is all serious business, huh? Well, it's not like there's no good reason for it. He's certain that everyone would feel a lot better when the human's body was no longer left inside the house, with its restless spirit lingering over them. "I don't know how long your attack lasts, so we need to hurry." Truthfully, Phobos does not know either; he's never used Hypnosis before, after all. He's not even sure if the effects of the move upon Shadowmere will remain benign, or if...if something goes wrong, then it'll be his fault. Everything so far, from the discovery of the dead red-eyes to this human, is like a shade of misfortune Phobos has brought among them. How would Isolde and Oliver react if his Hypnosis hurt their friend? I don't want to think about it. With his lack of both limbs and overall tangibility, Phobos is at a loss as to how he can help. He watches anxiously as Isolde begins to pull the human's body away from its place of death. It must have been undisturbed for a long time, and this almost feels like desecrating sacred ground better left undisturbed...but it has to be done, for Shadowmere's sake. With one Pokemon preoccupied and the other unable to interact in any helpful manner, Oliver is the one to grab the...what is it? The "gun"? The thing that the human used-used against itself. "Is that... the g-gun?" At least he's not the only one unadjusted to the new word. "Y-yeah. Just- gonna get rid of this, first." "I can go with you," Phobos offers; if he can't help move anything, then he could at least accompany the smaller Pokemon. Better than being completely useless, right, and aren't younger people supposed to stick together? "If you want?" Oliver quickly answered her question, "Y-yeah," before excusing himself, "Just- gonna get rid of this, first." She had to trust that he knew how to get rid of the dangerous device, and given the way he was treating it, she knew he wouldn't fool around with it. She also had to consider that it might do the child some good to get out of the room for a while. Not everyone was used to dealing with the dead. Granted, the warmer climate meant that the smell was a lot stronger than what she was used to. Her eyes focused on the window in the room, and she flew over to it to inspect it. Maybe it was big enough? Actually, regardless of that, the room probably needed to air anyway. With that thought in mind she found the part that she was supposed to grab and pulled the glass contraption up to allow fresh air to come in. The smell of burning was hopefully better than the death smell. Before Oliver left, Isolde turned her head from the window to look at him and said, "If you're going outside, I should be able to hear you if you call for me." And with the window open, she'd be able to get to him quickly. Oliver wasn't sure what exactly he expected Isolde's response to be to his assertion that he was going to go dispose of the gun. He does know, however, that he didn't expect Phobos to say anything to him, and yet, that is what happens. "I can go with you. If you want?" His head jerks back in shock as he turns wide brown eyes to look at Phobos, looking first over at Isolde before accepting that yes, he was speaking to him. If anyone else had been around who was conscious he might've looked over his shoulder just to make sure they weren't in the doorway, but as it is, it's just the three of them right now. Because no way is Shadowmere already awake. Heck, if she is, then Phobos deserves a refund from Arceus for such a useless Hypnosis attack. "I-I- uh- s-sure. If you really want?" Someone wants to go with him somewhere. That's new. Usually he's the one following others. "If you're going outside, I should be able to hear you if you call for me." "We are, yeah." Still awkwardly holding the thing, he walks on two legs towards the door. "Should just be a minute." Is she going to drag the body out there while they're out there, or bury it in the front yard? Option A means they have to watch, but Option B means they get to see a grave every time they return home. Neither is all that great, but that isn't a new occurrence. He walks the gun outside through the kitchen's back door, carrying it over to the far left side of the yard, where he sets it down. Cracking his knuckles, he sets about digging. Time to bury this thing forever. Oliver seems shocked, his reaction certainly nothing Phobos expected, and a flicker of doubt runs through the ghost's mind. Was his offer really that unwarranted? There is nobody else around whom his voice could have been mistaken for. It plunges Phobos back into a cold reality-though they may have accepted him into their company, he's still the outsider of this group, a group that's already lost at least one of their own before. Ghosts like himself didn't belong here, bringing the risk of vengeful spirits upon them. Or maybe he's just being too sensitive. Phobos wishes he can berate himself vocally-it wouldn't have been the first time. "I-I- uh- s-sure. If you really want?" Oliver's positive affirmation immediately causes Phobos to perk back up, his fears temporarily proven wrong. 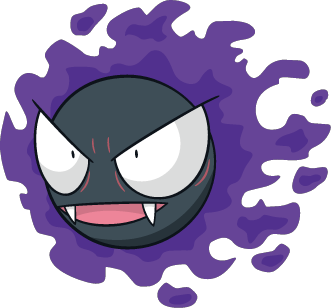 While his offer had primarily been motivated by a desire to help, the ghost can admit to also being curious about the Fire-type's expansive knowledge of humans. Sometimes it's okay to be a little selfish in the pursuit of learning. "I'd really love to tag along," Phobos confirms, hoping it will reassure Oliver. It is, after all, not a lie. But the ghost's mind keeps wandering back to his need to know more of humanity, and of his own kind. He has been running (metaphorically, anyways) from his sibling for so long, Phobos honestly doesn't know what he'd do with his life if that could change. Even so, he wants a normal life. He wants to be free from the fear, and this could be his chance. Phobos knows that one wrong question could spell disaster-after all, he hasn't yet discovered whether these Pokemon have ties with Deimos or not-but he has to take the chance. "We are, yeah. Should just be a minute." Silently, Phobos follows after Oliver as they leave the house without disturbing the sleeping Shadowmere. He doesn't have the tangibility to help with the digging, but the ghost's natural instinct is to keep an eye out on his surroundings. With his fellow ghosts, the slightest shadow could spell danger, even under the gaze of the morning sun. Who could know where Deimos was lurking at this very moment? His watching begins to resemble paranoia more than it does vigilance, but the ghost hardly notices. If there's one thing Phobos has caught onto, it's that there's no such thing as being too careful when it comes to his sibling. Thousands of questions rattle within him, each one pleading to be asked. Phobos turns his gaze back to Oliver, only to find the Fire-type still digging, working on being rid of that morbid gun. He says nothing, unwilling to disturb the other, but his curiosity is practically eating him alive. This is a Pokemon that knows far more than he does, and could potentially have the answer to his troubles...should Phobos say something...? Isolde was relieved when Oliver allowed Phobos to go with him; going outside in a group was better to ensure safety. Oliver quickly affirmed where they were going to Isolde, "We are, yeah. Should just be a minute." The monkey and ghost then left the room quietly, and Isolde moved the door so that it was mostly closed. She wanted to be able to get to Shadowmere quickly if the hound woke up quickly, but the fear of setting the hound off again dictated that she try something to prevent it. She almost called out to them to be careful, but she told herself that they were survivors. Yes, they were children, but they had survived this long alone. She shouldn't have to tell them to be careful. Children out of the room, Isolde turned her eyes back to the grisly task that she had chosen to take upon herself. The body had thankfully fallen flat on the human bedding, and she floated to one of the edges to pick up the heavy fabric. Bodies that could be found of her fellow swarm members weren't usually covered; their bodies were just dropped into the ground as they were. However, Vivillon were incredibly light, and moving something of this magnitude would be easier if she had an easier way to drag it. Also, if she took it as is, the body would fall apart, and that would be an even bigger mess to clean up. Thoughts of her old home filled her mind, and reminded of their meager attempts at retaining their burial rights, she hummed a tune that she always associated with burying the dead. It wasn't very loud, so as not to wake the hound, but it helped steady her mind as she folded the heavy fabric across the human's body. A thin piece of material caught her attention when she flew over the body to the other side of the bedding. She had started on the side where Oliver had grabbed the dangerous "gun," so this was found near the other hand. Curious, the Vivillon picked it up and tried to figure out what it was. It didn't feel like any of the fabrics she had encountered, and then she flipped the object over and realized it had a pattern on the front. She stared at it a little harder and realized that one of the entities of the picture had the same fur on their head as the one in the bed. She glanced back at the dead body as she took in the other beings that were depicted. There was at least one Pokemon that could be the one they saw in the white room. Did humans have a way to record their very images? Now that she thought about it, she thought she had seen some similar images around the house, and kicked herself for not looking harder and asking. She placed the object onto the solid wooden object near the bed; she would ask Oliver about it later. She finished wrapping the body up as well as she could with the fabric, and she noticed that there were thinner bits of fabric under the heavy one. She had an idea on what to do with those later, but for now, she needed to move the human. She once again took stock of how big the fabric wrapped body was and judged the width of the window. It would be a pain to move this thing through there, but she couldn't risk putting it too close to Shadowmere. However, it was doable. She took a huge breath in as she grabbed the foot end and pulled. Her huge white wings strained with the effort again, but the body thankfully moved again. She angled her back to the window to ensure she was going the right way, and there was a thump when she finally pulled it off the bed. She dropped the feet for a moment as she tried to figure out how she was going to lift it to the window. The Vivillon grabbed the feet again as she decided to try to continue dragging it. It was a good thing the body had decomposed a decent amount already, or she wouldn't have been able to do this at all. She was able to lift the feet to the window without having to carry the full weight, though she did notice fluid beginning to leak out near the head. Fitting her wings through the open window was no easy action, and then she had to pull the heavy thing after her. When she got it halfway out, she dropped the feet and grabbed the middle to continue pulling. The body was deposited outside as gently as she could, but, even then, she almost dropped to the ground to let her wings rest. She glanced around to see if Oliver or Phobos were nearby, and she thought she heard them talking towards the back of the house. She now had to figure out where she was going to put this thing. Were there any nearby trees? Or would she need to drag it towards the woods? Wherever she went, she needed to make sure that it was somewhere she could actually dig. Humans were fond of the hard material that was functionally like hard dirt, but impossible to dig through. She looked around and tried to see if there were any places she could bury the body that wasn't where they were trying to set up. She would prefer to go near the woods, but that was too far. Maybe a house or two over? She grabbed an end of the fabric again, and started to pull towards the front of the house and away from the children. She'd decide the specifics later.